Absolutely passionate about tax. SAICA IPD committee member. Inventor, programmer, entrepreneur and problem-solver. In March 2011, Evan had a problem. He had assumed he could complete his own tax return with confidence and ease. He was wrong. After hours of stress and frustration, he setup a meeting with his friend Marc. Marc knew all about tax and made the process quick and easy. Evan thought "What if I could put Marc's brain in a machine, then put it online, so that everyone could have their very own affordable tax man to help them?" 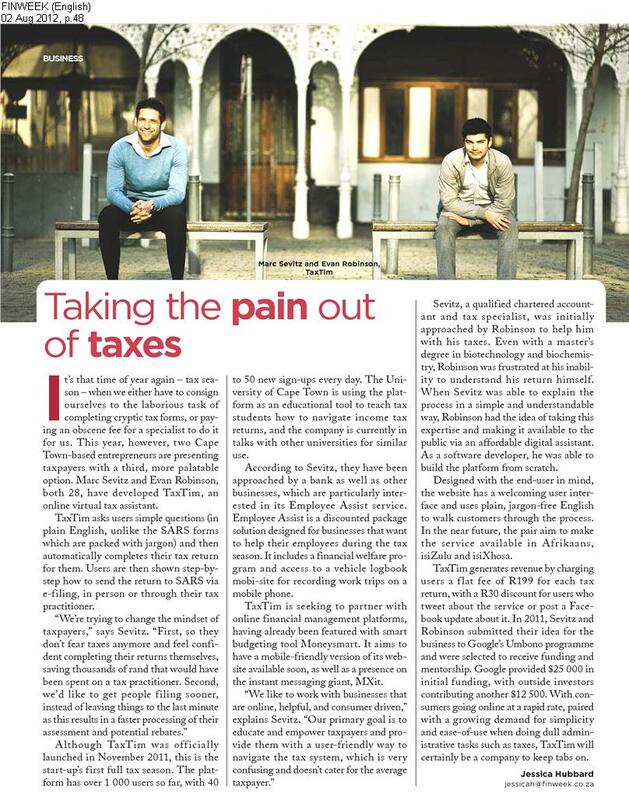 With initial seed funding from Google and some hard work, the two created TaxTim. TaxTim's award-winning simple and intuitive interface has helped over 1,300,000 South Africans with their taxes to date, whilst also teaching students about tax at UCT, WITS, UJ, UKZN, UP, UWC and other universities. In October 2014 TaxTim integrated directly with the South African Revenue Service for one-click direct electronic submission of tax returns. In June 2015 TaxTim and PwC launched PwC's TaxTim in Namibia at pwc.taxtim.com. In March 2016 TaxTim secured investment from Exponential, the innovation unit of JSE-listed company, MMI Holdings. Founder Mosaic Software, Nimbula and Amazon EC2.